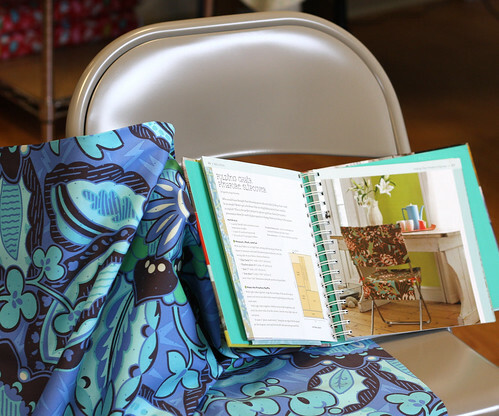 Welcome to Week 2 of the One Yard Wonders Sew Along! Kathy selected Amy Butler Soul Blossoms Home Dec. This fantastic print is called Trailing Orchid Blue Velvet. Highlights of Materials Needed: 1 yard of 54/60″ fabric (non-directional home decor weight) and 2 1/2 yards of 1/4″ grosgrain ribbon. 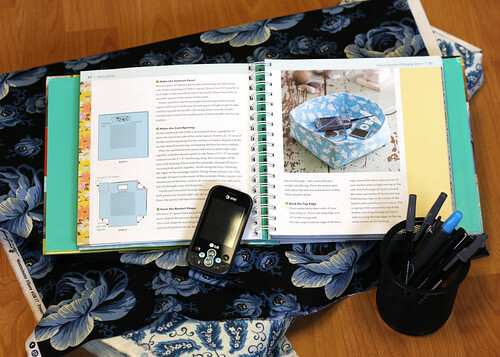 Carrie made the decision to use 2 different fabrics, one for the lining and one for the outside of the organizer. Both prints are from Denyse Schmidt Greenfield Hill: Preservation Peony Blueberry and Ladies League Blueberry. Highlights of Materials Needed: Light weight fusible interfacing, fusible fleece and heavyweight interfacing such as Timtex.